"Casual" is rarely ever seated next to the word, "opulence" because it's usually hanging out with "Mr. Luxurious" and "Mrs. Expensive." I decided to challenge the status quo, so I meshed the two opposites together and created an outfit that embodied both casual vibes and elegant opulence. Like with all other outfit combinations I adore, I wanted to share it here on Elizabeth, Marie, and Me. First off, the luxurious piece in this outfit is this Topshop embroidered jacquard skirt. The cobalt blue geometric pattern of the fabric reminds me of dainty Chinese porcelain dishes. Although it comes across as fancy and elegant, I think the brown buttons and paper bag silhouette lends itself to pair well with a casual feminine top. Puff sleeves seemed like a perfect match and what better fabric than linen to go with the texture of the skirt? I don't know about you, but I think the top and the skirt were made for each other and I am proud to say that I was the match-maker. Also, it just so happens that the buttons on this blouse are so similar to those on the skirt, so the two pieces look as if they could pass as a dress. Sometimes the smallest details can help pull the whole ensemeble together. For accessories, I leaned towards a rustic tropical vibe with this ivory macrame handbag. It has an undeniable vintage charm about it and I think the geometric shapes created by the woven threads subtly resemble those in the skirt. And you know I wouldn't post any outfit here unless it had at least one piece of jewelry. 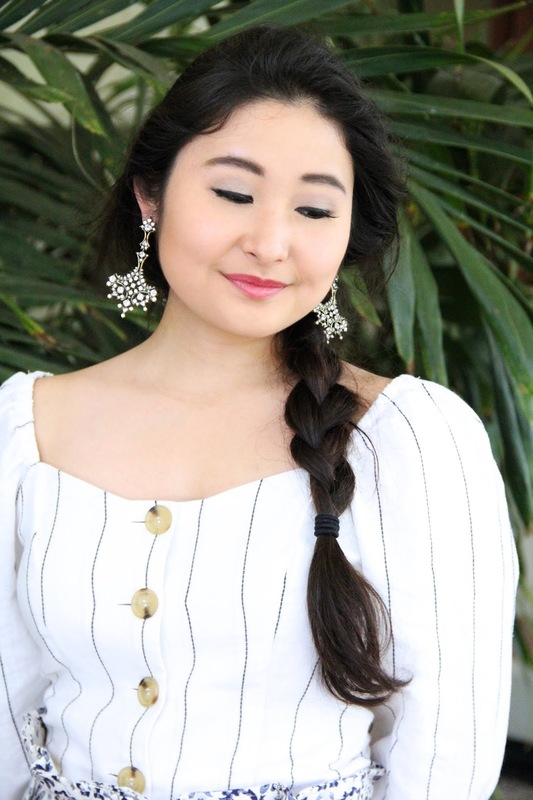 I kept the elegant rustic charm with these chandelier earrings and a cuff bracelet. Nothing too over the top, right? Lastly, a girl's gotta have shoes, so I opted for these simple white mules. Here's a fun fact: Mules originated in Ancient Rome and they became popular in the French court in the 18th century, making them Marie Antoinette's shoe of choice. With that said, I thought wearing mules with this outfit just seemed like the right choice. I couldn't go wrong with a queen-approved pair of heels, right? What do you think about this look? Be sure to let me know in the comment section below! I truly hope you enjoyed reading this outfit post. Until my next post, I am sending you lots of love from my heart to yours!